The Six Thinking Hats, designed by Dr. Edward de Bono, is an ingenious framework to think through a subject in a focused way that makes time and space for creative thinking [C-19]. It is used extensively in companies such as DuPont, IBM, Prudential Life Insurance, British Airways and Siemens to have efficient, productive meetings. The underlying principle in the Six Thinking Hats framework is that parallel thinking is more productive than argument. There are six symbolic hats as shown in Figure C6. Each hat has a different colour and represents a different dimension in thinking about the subject being addressed. Everyone wears the same hat at the same time. The hats can be put on and taken off depending on the sequence of thinking that makes the most sense. 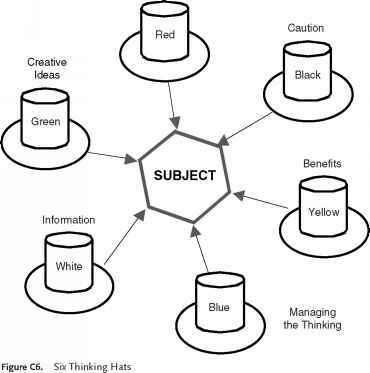 The White Hat deals with information, the Red Hat with feelings, the Black Hat with caution, the Yellow Hat with benefits, the Green Hat with creative ideas, and the Blue Hat with thinking about the thinking process. The Six Thinking Hats can be used either individually or in groups. The worked examples below illustrate its use. The first (A) takes a hypothetical human resource issue, the second (B) concerns introducing a new business [C-2]. (A) The Company wishes to introduce a four-day week for all staff. It gathers representatives from within work groups and across them to discuss the issue using the Six Thinking Hats procedure. Facilitator managing the process, thinking about thinking. Choreographs the procedure, decides which hats to be worn. 2. White Hat Information, data and needs. Responses: Which four days? How long each day? All staff the same four days? Responses: Might not see my lunch companion. Will need to change my car club. Responses: Will come refreshed. More time for hobbies. More time with family. 5. Black Hat Judgement, caution. Responses: Dealing with customers difficult. Productivity drops. 6. Green Hat Creative, new ideas. Response: Could have two days on, two days off in a cycle. (B) A strategic planning team in an R&D Division supporting a portfolio of business units developed a concept that could lead to a profitable new business. The new business would broaden the portfolio, capitalising on strengths of existing businesses. The concept was controversial. The business managers felt the plan would dilute resources from their businesses and strongly opposed the proposal. The R&D management was strongly in favour. Upper management scheduled a two-hour meeting to resolve the issue. The R&D team organised the meeting based on the Six Thinking Hats framework, which was familiar to the group. The meeting started with a brief White Hat overview of the concept and discussion to clarify the proposal. The facilitator then had everyone put on the symbolic Black Hat. This created an energetic discussion among the business managers resulting in many flip charts listing serious difficulties inherent in the concept. This approach allowed the business managers to air all the reasons, many justified, why they were opposed to expanding the portfolio with this new business. The facilitator then had everyone switch to Yellow Hat thinking. There was dead silence. The R&D people purposely said nothing. Then one of the business managers noted a benefit. Then another business manager noted another benefit. Within 15 minutes all of the business managers joined in and there were as many flip charts on benefits as there were on difficulties. Next, the facilitator moved to the Green Hat to generate ideas on how to retain the benefits while overcoming the difficulties. By this time everyone was energetically generating ideas to upgrade the proposed concept to make it workable. The outcome was that the R&D team was charged to develop an implementation plan for further review embodying the changes suggested by the business managers who now strongly supported the proposal. TRIZ is a problem solving method that was developed by Genrich Altshuller over a forty-year period in the former Soviet Union [C-20], it has many devotees, used in many major companies and there is an on-line journal devoted to the topic [C-21]. The acronym is derived from the Russian for Theory of Inventive Problem Solving. It is very different from the other creativity techniques described above, in that it operates via a study of patterns of problems and solutions and not by the spontaneous creativity of individuals and groups. It was based on the analysis of over 1.5 million patents, since extended to 2.8 million, to discover patterns that predict breakthrough solutions to problems. What Altshuller did was to remove the subject matter from a patent to uncover the problem solving process. There were three primary findings from this research of the patent literature. 1.8 Tools for Creativity 1177 From these studies he was able to categorise the solutions to problems into five levels. • Level one. Routine design problems solved by methods well known within the specialty. No invention needed. About 32% of the solutions fell into this level. • Level two. Minor improvements to an existing system, by methods known within the industry. Usually with some compromise. About 45 % of the solutions fell into this level. • Level three. Fundamental improvement to an existing system, by methods known outside the industry. Contradictions resolved. About 18% of the solutions fell into this category. • Level four. 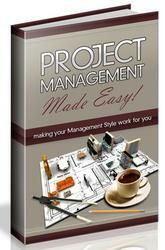 A new generation that uses a new principle to perform the primary functions of the system. Solution found more in science than in technology. About 4% of the solutions fell into this category. • Level five. A rare scientific discovery or pioneering invention of essentially a new system. About 1% of the solutions fell into this category. He also noted that with each succeeding level, the source of the solution required broader knowledge and more solutions to consider before an ideal one could be found. This is consistent with the need for more creative thinking as we go up the levels. What Altshuller postulated was that over 90 % of the problems engineers faced had been solved somewhere before. If engineers could follow a path to an ideal solution, starting with the lowest level, their personal knowledge and experience, and working their way to higher levels, most of the solutions could be derived from knowledge already present in the company, industry, or in another industry. Altshuller found that each of the most inventive patents primarily solved an 'inventive' problem, which he defined as those which contain conflicting requirements, which he called 'contradictions'. An example of a technical contradiction is provided by an automobile airbag, which needs to deploy very fast in order to protect the occupant (good) but the faster it deploys the more likely it is to kill small people (bad). An example of a physical contradiction is provided by coffee that should be hot to be enjoyable but cold enough not to scald the customer. He defined 39 basic properties and 40 principles for solving problems containing contradiction in any two-of-39 properties (see Tables C5 and C6). By extracting and organising the most frequently occurring contradictions and the principles of the resolution of these contradictions, a matrix of 39-improving parameters and 39-worsening parameters (39 x 39 matrix), with each cell entry giving the most often used (up to four) of the 40 inventive principles, was created. This matrix is known as the contradiction matrix. 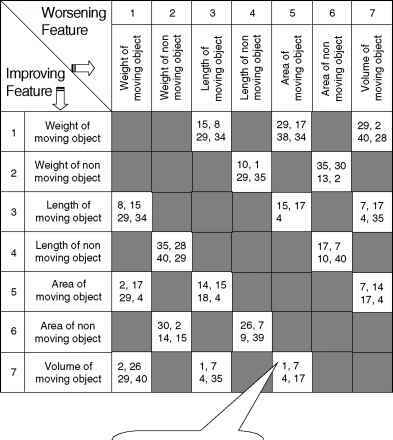 This matrix is the simplest and the most straightforward of all the TRIZ tools, and also the one most commonly used. A small corner of such a matrix is shown in Figure C7. 1. Life cycle of birth, growth, maturity and death, e.g. steam engine and propellers replaced boats with oars. 2. Trend ofincreasing ideality, e.g. printers with better resolution and printing speeds. 3. Uneven development of sub-systems resulting in contradictions, e.g. powerful aero-engines developed faster than the wing design. 4. First to match parts and later mismatch parts (to gain advantage), e.g. pocket-knife with one blade, then many blades, finally with scissors, screw-drivers, can openers etc. (Swiss Army Knife). 5. Increasing complexity followed by simplicity through integration, e.g. PCB with lot of components leading to Integrated Circuit. 6. Transition from macro-system to micro-system, e.g. rolled glass sheets to float glass; steel rollers with reducing diameters ultimately lead to molecules of molten tin acting as rollers. 7. Technology follows increasing dynamism and controllability, e.g. wooden pointer, to telescopic pointer, to laser pointer. 8. Decreasing human involvement with increasing automation, e.g. all on-board controls on Satellite. Whilst TRIZ has been used most effectively in the engineering fields it obviously has applications in many other industries, especially in the chemical and process engineering fields, where significant advances have been claimed in improving yields, product design and resource utilisation [C-21, C-22].